A close-up view of a copepod, a tiny crustacean that is ubiquitous in the ocean and a major source of food in the marine food web. They can also act as hosts for bacteria, including pathogenic ones. MIT-WHOI Joint Program graduate student Amalia Aruda Almada investigated relationships between copepods and bacteria. The next time you encounter scientists, ask them about the Eureka moment that spawned their research pursuits. You might hear about ideas that emerged from scribbles on the back of napkins at a noisy bar or from bubbles during a long hot bath. For me, it all began in a cramped classroom as I pored over a research paper about bacteria in poop. It wasn’t the most glamorous source of inspiration, but this paper spurred a scientific awakening. I learned that there were at least as many microbial cells in my body as human cells. I could almost feel my brain rewiring as I realized that my body was not just mine, but in fact a home to millions of symbiotic microbes, and that this collective microbial community, called a microbiome, exerted remarkable influence on my development, metabolism, immunity, and even behavior. I was more than just a human. I could be considered a “superorganism” comprised mainly of microbes. A few days later, more inspiration came my way, wrapped in a sari. 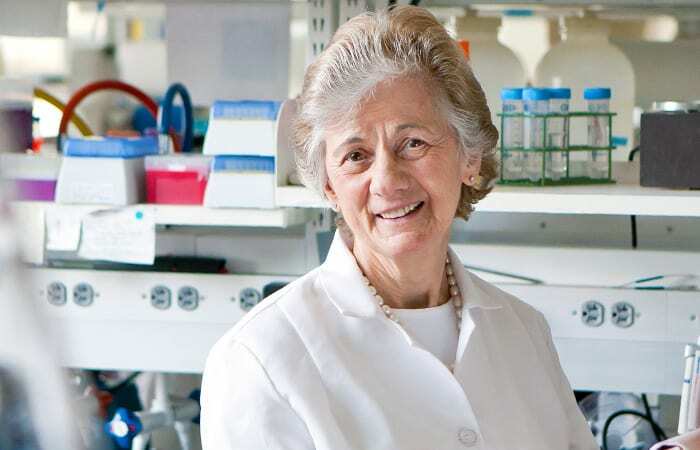 I heard a story about how in 2005, a team of microbiologists led by Rita Colwell discovered an easy way to dramatically reduce the spread of cholera in Bangladesh. They found that if people simply filtered drinking water through their folded traditional garments, they could lower their cholera infection rates by 50 percent. 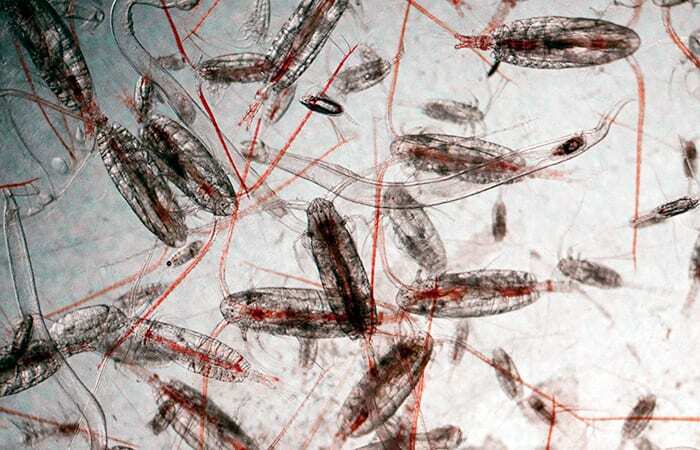 The filtration removed copepods—shrimp-like animals the size of a grain of rice—which can carry an infective dose of bacteria called Vibrio cholerae. 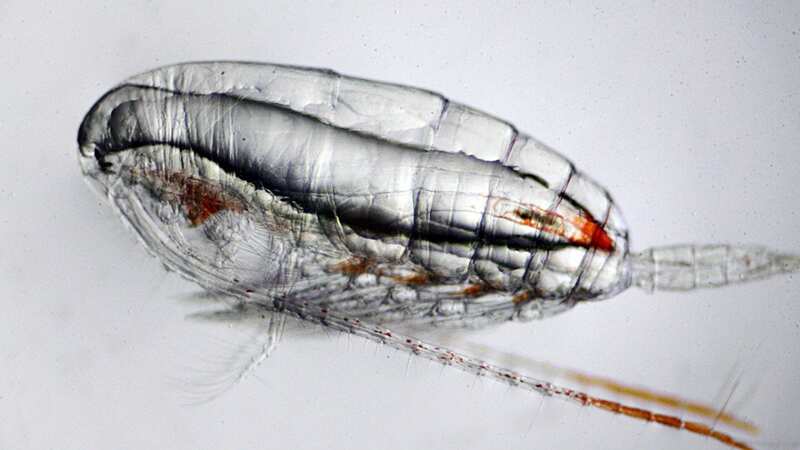 The bacteria attach to copepods, receiving more food and protection than “free-living” bacteria in the open ocean, and perhaps some advantageous transportation, too. Thus began my journey to investigate questions that hadn’t been explored before. Was this just a one-way relationship, or did copepods also receive benefits from their hitchhiking companions? Were copepods just passive rafts for bacteria, or could individual copepods actively attract or avoid particular types of bacteria from attaching to them? Could the copepods, in turn, exert controls over bacterial lifestyles in different ways—and thereby influence bacteria populations in the environment? Though tiny, copepods are innumerable. They constitute the greatest animal biomass on Earth and are a crucial link in the ocean food chain. So answers to these questions could be game-changers for figuring out how different bacteria, including pathogenic ones like Vibrio cholerae, survive and thrive in the environment. I can barely remember a time when I didn’t want to be a marine biologist. As a 12-year-old on a family vacation, I took a tour of the Woods Hole Oceanographic Institution (WHOI) and envisioned where I wanted to be someday. As a freshman at Georgetown University, I finally had my chance to start living my dream. I made dozens of phone calls, looking for ways to become a guest student at a marine lab during the summer. One of those calls was to Ann Tarrant, a biologist at WHOI. Her enthusiasm about her research enthralled me, and I gratefully joined her lab for the summer. At the time, I knew nothing about molecular biology or copepods. Starting with how to use a pipette, Tarrant taught me about both. I returned to her lab after my junior year, this time as a WHOI Summer Student Fellow, to continue our research project on copepods. In my senior year, I listened to advice from my first and perhaps one of my most important scientific mentors, my dad. He urged me to contact Colwell to talk about her work. Colwell had just recently stepped down as director of the U.S. National Science Foundation and was back at the University of Maryland campus. After an uneasy night’s sleep, I arrived on campus an hour before our appointment, before most students were awake, nervously pacing in anticipation of meeting my scientific idol. I second-guessed why she had even agreed to fit a meeting with an undergraduate student into her extremely busy schedule. But I am so glad that she did. Her ensuing encouragement gave me the courage to pursue a Ph.D. in the MIT/WHOI Joint Program in Oceanography and to follow my interests in studying the copepod’s relationship with Vibrio and other bacteria. In the years that followed, Tarrant became my Ph.D. advisor and Colwell was on my dissertation committee. Their mentorship and relentless enthusiasm continually brought me back to the big picture when I was frustrated with the day-to-day difficulties of performing scientific experiments in the laboratory. And difficulties there were. My research hinged on keeping alive a thriving, breeding population of copepods on which I could perform experiments. As someone who relied on my roommate to help keep my one houseplant alive, this was a daunting task. I would like to say that I knew that Eurytemora affinis was going to be the perfect copepod species for my project. But the truth is that this was the only species that I could keep alive for longer than a week. 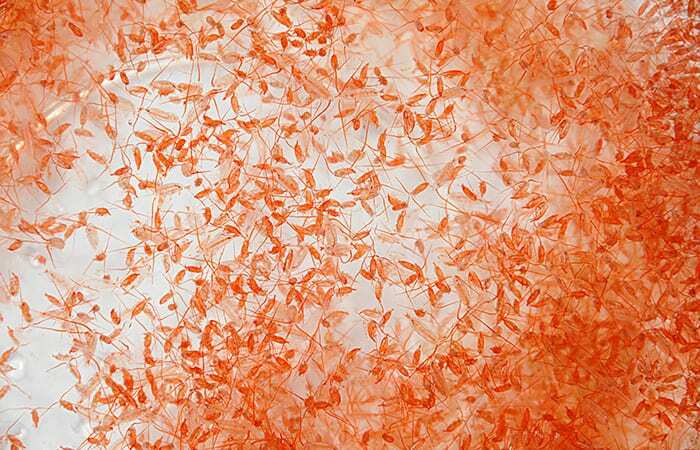 I had tried to grow a lot of different kinds of copepods collected from many different places, from the salt marshes around my house to Amazon.com. A colleague even drove a bucket of copepods up to me from Connecticut. Without fail, within about a week, all of the copepods died. Digging through articles and blogs about copepod rearing only deepened my frustrations as copepod aficionados bragged about how “easy” it was to grow these critters. I slowly picked up fundamental tenets about rearing copepods, which I learned the hard way, including that copepods don’t appreciate soap on their glassware and that they are happy when their food (phytoplankton) is healthy. Finally, on my last attempt to rear the copepods in the lab, I received a shipment of E. affinis from a collaborator, Carol Lee at the University of Washington. She assured me that rearing these was going to be a piece of cake. Thankfully, this species was especially hardy (i.e, Amalia-proof), and I finally brought the pieces together to have a happy and reproducing copepod population to work with. My experiments took place in a chilly room that hummed with the sound of air bubbling into tiny glass bottles. For 24 hours, copepods stewed in these bottles with high concentrations of two distinct species of Vibrio bacteria: Vibrio sp F10 and Vibrio ordalii. Both inhabit similar coastal environments with my copepod species, but V. sp F10 are known to live in colonies on copepods, while V. ordalii are often free-swimmers in the open ocean. 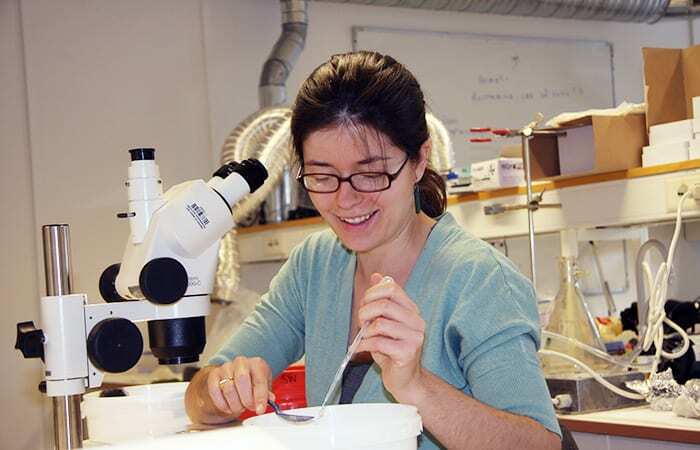 Did exposure to the different bacteria stimulate any changes in the copepods’ physiology? To investigate this, I delved into collections of molecules known as ribonucleic acids (RNA). You’ve probably heard of genomes. These are the collections of deoxyribonucleic acid (DNA) molecules that all organisms have. They inscribe instructions for building proteins and other molecules essential for maintaining cells. To carry out these instructions, DNA is transcribed into corresponding molecules of RNA. Each RNA transcribes code from DNA to make a specific protein used for a specific metabolic function. The collection of all these RNA molecules is called the transcriptome. The genome is what the organism can do; the transcriptome is what it does do. You can think of the genome of an organism like a menu, which describes every dish that the restaurant could make. But different customers have different appetites and don’t want or need everything on the menu at one given time. By taking a look at their final bill, we can see what the customers actually ordered from the menu and what the chef cooked up. Similarly, by analyzing the entire collection of RNAs (transcriptome) in a cell, researchers can begin to determine what genes were turned on or off in response to particular environmental conditions that copepods were exposed to. If copepods, for example, were stressed out by the presence of a certain Vibrio bacteria, they may have turned on genes to make proteins to prepare their bodies to fight infection. If so, we would detect this gene expression by an abundance of the RNA copies of these genes in their transcriptomes. On the other hand, the copepods might not even notice their bacterial hitchhikers, and their transcriptomes would show little change. After a few months of crunching hundreds of gigabytes of our data on a supercomputer, we finally got our answer. Copepods do in fact interact dynamically and discriminately with different bacteria. I found that the open-ocean V. ordalii elicited virtually no transcriptomic response in my copepod species. But when I exposed copepods to V. sp. F10, which does colonize copepods, the copepods showed no signs of being sick, but we found a dramatic increase in the expression of a handful of copepod genes—many of which are involved in the immune response. So why would the copepods have an immune reaction to bacteria typically found living on them? Because even when bacteria provide crucial functions for their host, too many of them can be a bad thing. Many recent studies of other invertebrates such as insects and squid have found that hosts will often use a particular set of immune genes to help attract one spieces of symbiont over another and yet also keep these symbionts in check. While the copepods were responding to the V. sp. F10, we noticed that the bacteria were also changing dramatically because of their interaction with the copepods. When V. sp. F10 were taken off the copepods, they weren’t always able to grow and eat quite as well. This doesn’t necessarily mean that associating with copepods is harmful to the bacteria, but rather that it may induce the bacteria into a dormant-like phase. We believe that this allows vibrios to avoid consuming too much energy as they hunker down and find refuge on copepods, and thus enhances the bacteria’s ability to survive. We now know that there is an active dialogue between copepods and vibrios and that copepods can have a big influence on the types and activity of bacteria that survive in the environment. And I uncovered so many more interesting questions: Why do the V. sp. F10 bacteria respond to the copepods and how do they know that copepods are present? Why do the copepods respond to some vibrios but not to others? Do copepods respond to pathogenic vibrios such V. cholerae? Anything we learn about the mechanisms that govern how microbiomes assemble on copepods would begin to give us deeper understanding about the inner workings of animals, bacteria, and our environment. With bacterial communities living in, on, and all around us, the complexity of the nearly invisible microbial world we inhabit appears endlessly ripe for budding scientists awaiting their own Eureka moments. This research was supported by the National Science Foundation, the Ocean Venture Fund at WHOI, an Environmental Protection Agency STAR Fellowship, and an NSF Graduate Research Fellowship.